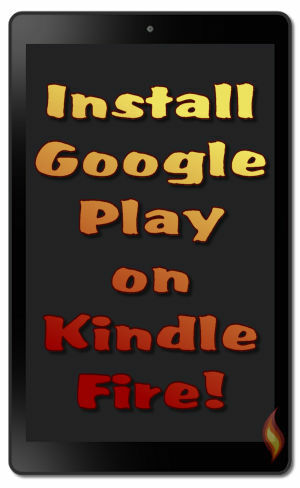 A quick tutorial on how to install Google Play on Kindle Fire: quick tips & tricks to show you how to get Google Play on your Kindle Fire in a few minutes. We all know how popular Kindle Fire tablets are and that there are millions of their users all over the world. In the Amazon Appstore for Android there are hundreds of thousands of apps & games for our Kindle Fire (check the latest Kindle Fire versions available). However, one thing is missing, and you probably know what we're talking about. It's Google apps! Fortunately, this is something we can easily fix. 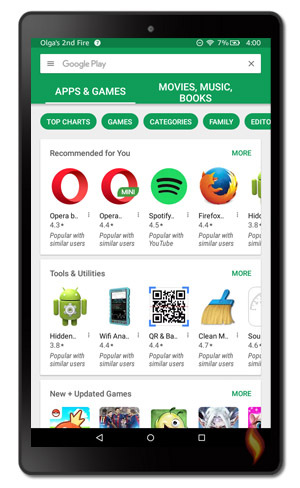 In this tutorial we will show you how to install the biggest appstore - Google Play - on your Kindle Fire, after that, see the follow-up article: 10 top Google apps you can install on your Kindle. Note that this tutorial won't work on the older 4.x.x.x versions of Kindle Fire OS (Operating System). It will only work with 5.x.x.x versions of Fire OS. Kindle Fires released 2015 and later, have version 5. Some 2014 models might have OS 5 as well. 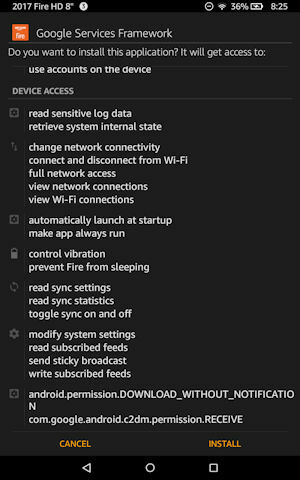 To determine which Fire OS version your tablet is running, go to Settings -> Device Options -> System Updates. If it says Fire OS 5.x.x.x (x = any number) than this tutorial should work on your Kindle Fire. To learn more about different Kindle Fire models and know which one you have, go to the Kindle Fire technical specs and Kindle Fire comparison chart pages. Even though the Google Play Store and all of Google's own apps are missing from the Amazon Appstore, you can easily sideload them to your Kindle Fire. The great news is that you don't even have to root or modify your device in any way. All you need is in this tutorial. Getting Google Play on your Kindle Fire is a one-time process and no advanced knowledge or any special skills are required. Note that each of the above files is a link to APKMirror which lets you download APK files (apps you can install) of many different Android apps. There are a few different ways you can download and install these files. The easiest is to download them directly to your Kindle Fire (shown next in Option A). Another way is to download them to your PC/laptop and then transfer them to your tablet (Option B). A new page will load and after a few moments the file will try to download. However, you might get a warning message before you can continue. If you do, tap "OK". The file will begin to download and you should briefly see the following windows pop up at the bottom of your screen. 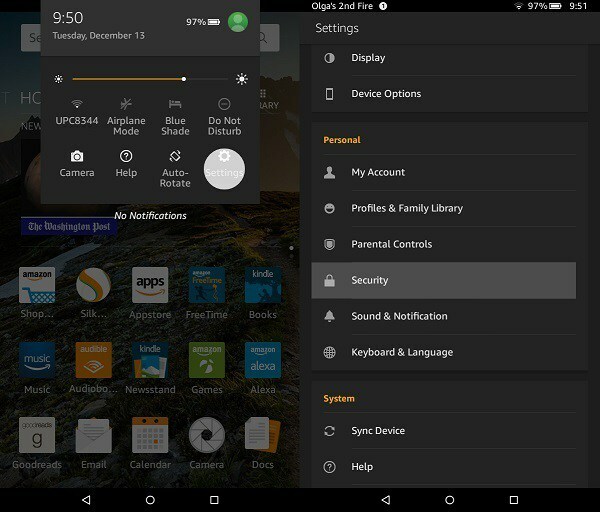 For this option you will need: Your Kindle Fire tablet (connected to the Internet), a USB cable (for transferring files), your desktop computer and a few minutes of your time. Similar to Option A, you will need to go to the four APKMirror links above and click on the DOWNLOAD APK button to download each app file to your desktop/laptop computer. Connect your Amazon tablet to your computer with the use of a USB cable. When your computer recognizes your tablet you will see Fire under Devices and drives. Next, copy these files to the existing folder on your Kindle Fire or create a new one (and name it, for example, APK). Of course, you don't have to transfer these files manually (if you don't have a USB cable at hand, for example). 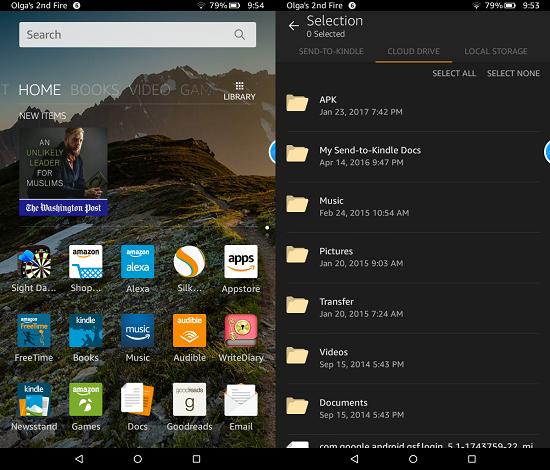 You can use some cloud service and transfer these files wirelessly, as shown next, or see Rachel's article on transferring files to your Kindle Fire for additional options. Sign in to your Amazon Drive on your desktop/laptop computer (the one where you copied the files). Make sure you log in to the same account that your Kindle Fire is registered with. 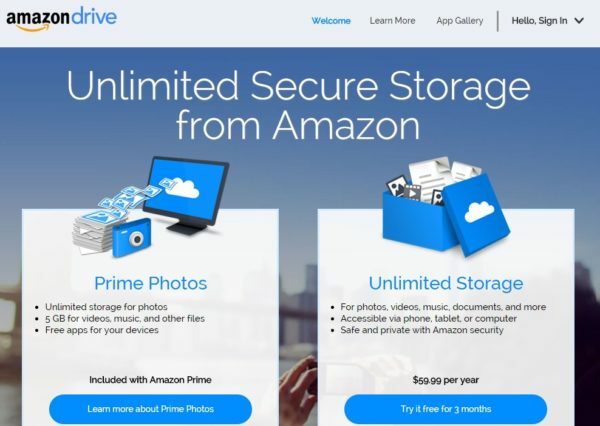 You can log in to the Amazon Drive here. Just like you did with transferring files manually, you can simply create a new folder or use an existing one to copy the downloaded files to. 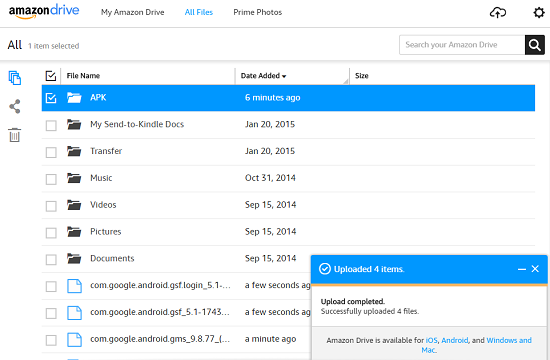 Now you need to access your Amazon Drive and the files you have just transferred from your Kindle Fire. Click on Docs (the icon on the home screen in the app grid) to ensure that the APK files have been correctly uploaded). 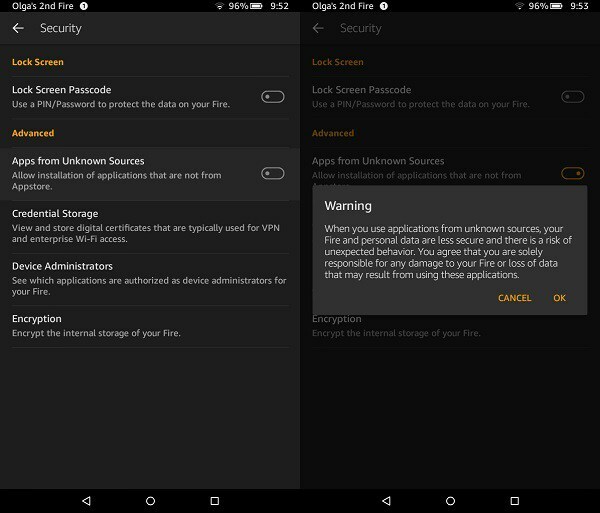 Before you can install these files, make sure the necessary security setting on your Kindle Fire is turned on, which is explained next. If you have never installed any app outside of the Amazon Appstore on your Kindle Fire, you will first need to allow the installation of apps from unknown sources or you won't be able to install the app. Don't worry, though, we explain it in detail in the short section below. If you already have this security feature turned on, skip the next section and continue on with "Installing the Necessary Google Play Store Apps" below. The Kindle Fire, by default, won't allow you to install apps outside of the Amazon Appstore. This is, obviously, for security reasons. The apps you need to install for this tutorial come from outside of the Amazon Appstore so you need to first allow the installation of unknown apps. 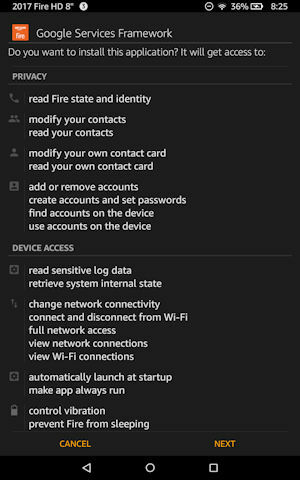 Go to Settings (just swipe down from the top of the screen to access quick settings and notifications) and then choose Security. Under Advanced you will see Apps from Unknown Sources. Tap the toggle button to allow the installing of apps from unknown sources. Click OK to dismiss the warning. If you have correctly activated installation from unknown sources, the toggle button will be orange like on the screenshot below. Your Kindle Fire is now ready for installing apps from unknown sources. This is an extra functionality but it may also mean extra risk. Be careful and don't install any app you don't fully trust. What you have to do now is install the four APK files in the following order: Google Account Manager, Google Services Framework, Google Play Services and Google Play Store. The easiest and the quickest way to install the files on your Kindle Fire will be to use the Docs (Documents) section on your Kindle Fire. You can find the Docs shortcut icon on your Kindle Fire's HOME screen and then tap the Download folder (or if you used a different folder during Option B go to where you saved the files). If you used Option A the files that were downloaded will have a really long name but if you saved them in the proper order you can install them by date and time, starting with the oldest time stamp and moving forward to the newest. Below is an image showing the order when the files are sorted by date (tap the sort icon at top right, the one that has three uneven lines). Be sure to check the FILE NAME of the apk files on your Kindle Fire before installing them, to make sure you install them in the proper order. When you tap the file you'll need to scroll down to the bottom (or tap the "NEXT" button at the bottom right) before the "INSTALL" button will be available. After the app is installed tap the "DONE" button to return to the Docs and install the next file. During testing we did discover one issue. If you have trouble installing the files because the "INSTALL" button will not work (when you tap on it and nothing happens), or other problems with the files installing/running, try turning your Kindle Fire off and then back on. That fixed the issue for us, so if you experience this problem hopefully it will work for you too. When all four files have been properly installed you should find the Google Play Store App at the bottom of your Kindle Fire's HOME screen. 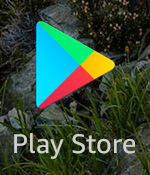 Please note that this app, and those you install from Google Play, will not show up on your APP screen. Go ahead and tap the Play Store to open it. You'll need to login to your registered Google Account by signing in with your email address and password, or create a new account if you've never signed up with Google before. Once you're signed in and the app does a little update, the full Google Play Store should be ready to use! 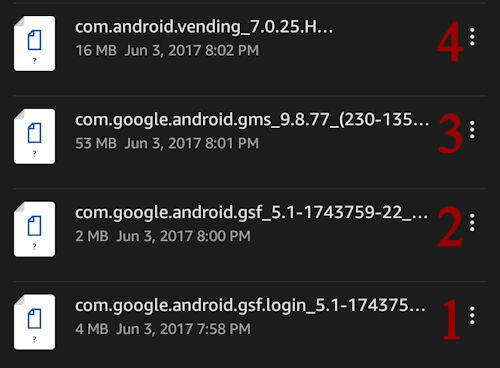 After you check that Google Play Store successfully works for you, go ahead and delete the four apk files you downloaded. You will no longer need them, and they are taking up space on your Kindle Fire. The app image on your tablet might make a slight change after updating (no white briefcase image behind the triangle icon). Now you're ready to install apps from the Google Play Store! 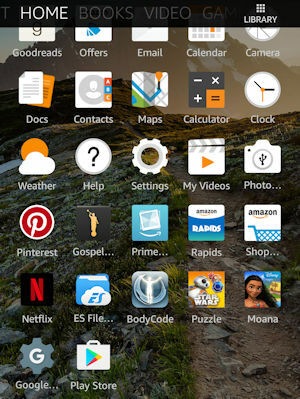 If you'd like some recommendations, here's a list of the Top Google Apps to Install on Kindle Fire. By following this awesome tutorial you should be able to easily install the Google Play Store on your Kindle Fire. Once you've signed in to Google, you can download your previously purchased apps, and even restore in-app purchases. However, due to the nature of the Kindle Fire, it is possible that some apps will not properly run, so you'll have to test out your favorite apps to see if they will work on your Fire tablet. But at least it's an option now! We hope this tutorial was helpful and you managed to install Google Play on your Kindle Fire without any problems. If you have any questions, feel free to leave us a comment in the comment box below. We ♥ Our Kindle Fires! This article was written by both Olga and Rachel. Olga created the initial article with most of the text and images and then Rachel tested the process, added additional instructions, details, several screenshots from her Kindle Fire, and changed things here and there. So this article was a great collaborative effort which shows what an awesome team we are!